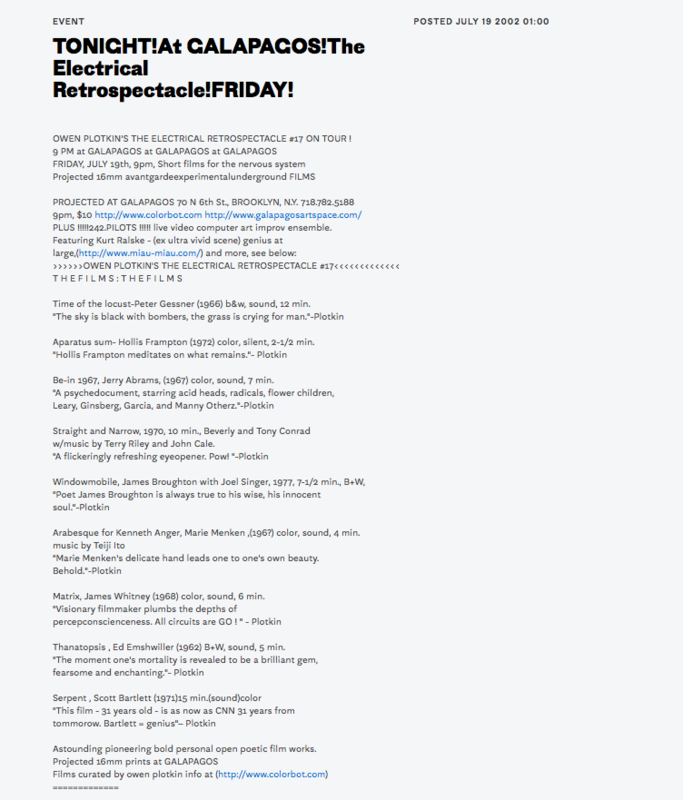 OWEN PLOTKIN’S THE ELECTRICAL RETROSPECTACLE #17 ON TOUR ! This entry was posted in owen plotkin and tagged avant garde, avant garde film, curator, experimental film, film, owen plotkin on August 7, 2016 by Iamowenplotkin2. This entry was posted in owen plotkin and tagged allen ginsberg, avant garde film, experimental film, film, filmmaker, owen plotkin on February 6, 2016 by Iamowenplotkin2. Owen Plotkin earned his MFA from NYU Maurice Kanbar Institute of Film and Television,Studied coding at NYU Center for Advanced Technology in Multimedia.Attended Hartford School of the Arts, The Hartt School, western and contemporary music history.Co-Founded film editing company – the now corporation in 2003 and serves as chief officer. Plotkin’s tv and radio commercial voiceover work led to his membership in SAG AFTRA. He founded Hungrr,LLC in 2005 to help raise awareness to the facts and issues surrounding hunger in the USA. FILE Festival 2004 in Sao Paulo, Brazil, Electronic Language International Festival. Plotkin apprenticed with sculptor/welder Meyers Rohowsky and studied painting with Emily Sturkie. A self taught guitarist, he writes songs, sings and writes poetry. He studies voice with renowned composer and voice teacher Marisa Michelson. Plotkin practices TM. However he does not levitate.